Union Ministry of Tourism Government of India has an autonomous body namely, the National Council for Hotel Management and Catering Technology (NCHMCT). NCHMCT conducts the Joint Entrance Examination (JEE), which is commonly known as NCHMCT JEE and NCHM JEE for Hotel Management Course. The NCHMCT JEE is required to take admission in B.Sc in Hospitality & Hotel Administration programme, which is offered jointly with IGNOU. The candidate will be able to get admission in any of 21 Central Institutes of Hotel Management, 19 State Government Institutes of Hotel Management, 14 Private Institutes of Hotel Management affiliated with NCHMCT and one Public Sector Undertaking by clearing the NCHMCT JEE Entrance Exam. Hotel Management as its name suggests is not only about cooking food or attending guests and showing hospitality in a luxurious room, it’s a big industry just like a tree has so many branches. Hospitality Industry is so vast and it includes supervision, co - ordination administration, accommodation, food & drink, management and much more. The hospitality industry is moving at an unprecedented pace, making hotel management a lucrative career option for a lot of students. However, before thinking about making your career in this diverse and promising industry, you need to know about the best colleges and programs that you can pursue to make your career in the field of hotel management. In this industry, you can handle many areas and can develop skills in management, interpersonal skills, financial management, human resource management, communication skills etc. The NCHMCT exam notification 2019 has been announced jointly by IGNOU and NCHMCT. NCHMCT offers admission in B.Sc in hospitality and hotel management in 58 campuses of IHM. It is a 3-year program. As per the Hotel management entrance exam admission 2019 notification, NCHMCT JEE Entrance Exam will be held on April 28, 2019. A pass 10+2 from recognized Central/State Board in any stream with English as one of the main subjects. The appearing candidates may also apply but such candidates have to submit the proof of passing the qualifying examination latest by September 2019. The maximum age limit for GEN/OBC/PH candidates is 22 years as on 01.07.2019. For SC/ST candidates, the upper age limit is 25 years as on 01.07.2019. It is mandatory for all the qualified candidates to submit physical fitness certificate at the time of admission from a Registered Medical Practitioner. Courses: NCHMCT JEE 2019 is conducted for admission to B.Sc in Hospitality and Hotel Administration. Number of Questions: There will be total 200 Questions in Joint Entrance Exam. Aptitude, Reasoning and Logical Deduction, General Knowledge & Current Affairs, English Language and Aptitude for Service Sector. Language: Question Paper will be bilingual i.e. in English and Hindi. Duration: The examination duration will be 3 hours (10:00 a.m. to 1:00 p.m). Marking Scheme: Each correct answer will carry 1 mark while for each wrong answer,0.25 marks will be deducted. This marking scheme will be applied under Numerical Ability and Analytical Aptitude, Reasoning and Logical Deduction, General Knowledge & Current Affairs and English Language. Graded marks will be awarded under Aptitude for Service Sector component. The most appropriate answer carries 1.00, the next appropriate answer carries 0.75, the next to next appropriate answer carries 0.50 marks and – 0.25 marks for an inappropriate answer. The candidates participating for the examination of the NCHM should note that the NCHMCT (National Council for Hotel Management & Catering Technology) will be releasing the official notification for the examination in the second week of December 2017 and for which the exam will be conducted in the month of May 2019. They should also note that the exam pattern is too tricky for the NCHM examination but is not tough. The command over the syllabus and other aspects will surely open chances for the candidates in all sectors. 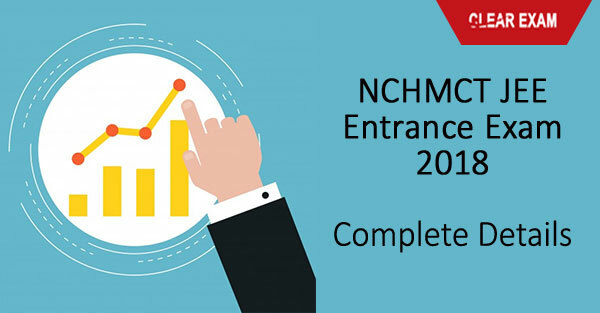 NCHMCT JEE 2019 admit card will be available to download from 20th April 2019 to 28th April 2019. Students are advised to download retain at least 2 copies of admit card. The hall ticket will not be sent to any candidate by post. NCHMCT JEE 2019 result will be announced online through the council’s website. It is expected that result will be announced in the third week of May 2019. No further interview or GD will be conducted. The merit list will be prepared on the basis of marks secured in JEE written test. NCHMCT will conduct centralized counseling. There shall be three rounds of counseling. The counseling schedule will be declared along with the declaration of result. The process for seat allotment of National Council for Hotel Management Joint Entrance Exam will commence from the mid of June by NHMCT (National Council for Hotel Management and Catering Technology). The allotment of the seat of NCHM JEE 2019 will be done on the choice of institute selected by the candidate and on All India Rank (merit) scored by the candidate. Soon after the declaration of result, the seat allotment of NCHM JEE 2019 is done in three rounds together with counseling schedule. People world over have become akin to discovering and exploring new places. Traveling goes hand in hand with staying at a place away from home. People who travel are always in search of affordable and hospitable hotels where everything would be easily available as well as accessible at pocket-friendly prices. However, the important question we all ask ourselves before choosing a career is about the kind of damage it would be in the pocket. Agreed that there is always an ROI when one gets a good job and makes a stable career out of it, but that is not always a guarantee. Hence, asking and inquiring about the hotel management courses fee structure and how much each institute charges for the course is a practical and wise step. The tourism industry has witnessed a phenomenal growth in the past few years. The hotel and hospitality sector has been boosted too because of this. The increasing demand for good hotels has led to multiple hotel management jobs and career opportunities. Therefore if you are thinking about a course in Hotel Management, the time has never been better than right now. First of all, you have to appear for Hotel Management Entrance Exam. Here is a brief look at some of its important career opportunity after hotel management course. The Hotel and Hospitality industry has picked up the pace in the past few years thanks to the high growth in the travel industry. However, there is a lack of organization and trained hotel personnel in the entire country, irrespective of where the hotel is located. Because of this dearth, there is a huge career prospect in the hotel industry right now. National Council of Hotel Management and Catering Technology (NCHMCT) is a national level entrance exam to pursue hotel management course.